There were more than 200 POWs from Commonwealth countries among the inmates who passed through the Gestapo Police Prison in Terezín during World War II. This subject was discussed in an article called Prisoners of War from the Commonwealth in Terezín published in the Terezín Yearbook No. 45/2017. In this edition I would like to trace the specific fate of at least two Commonwealth soldiers, namely Denis McMahon and Thomas Moles. The Australian Denis Michael McMahon was born in the small town of Gunbower in the state of Victoria on January 11, 1913. With his wife Ruby Florence they had two children. McMahon joined the army in the town of Caulfield on June 26, 1940. 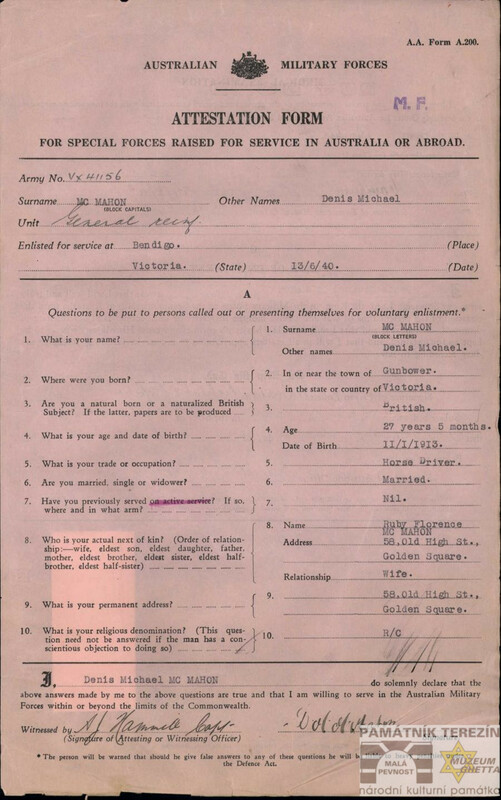 Following a compulsory army training course he set out from Melbourne to the Middle East on September 15, 1940. After nearly one-month voyage his ship landed in the then Palestine on October 12, 1940. There he underwent another spell of military training, and early in April 1941 he was deployed, together with his unit 2/8 Infantry Battalion, in Greece. After the lost battle near the town of Vevi in northern Greece the battalion had to fall gradually back. Due to the losses sustained the unit could no longer take part in further fighting on the Peloponnese Peninsula. Together with his comrades-in-arms, McMahon was evacuated from the town of Kalamity on the night of April 26, 1941. He was among the 394 troops of his unit who, after their transport ship had been sunk, were taken to Crete. On the island they were later attacked by the Germans. Following a lost engagement near the town of Khania they had to retreat southwards to the Sfakia area where, as a rear unit, they waged a delaying fight, covering the ongoing evacuation of British troops. Denis McMahon was captured during this action. On August 19, 1941 he was registered as a POW in the Stalag VII A prison camp at Moosburg in southern Bavaria. During his incarceration in the camp he was sent to work in Munich. 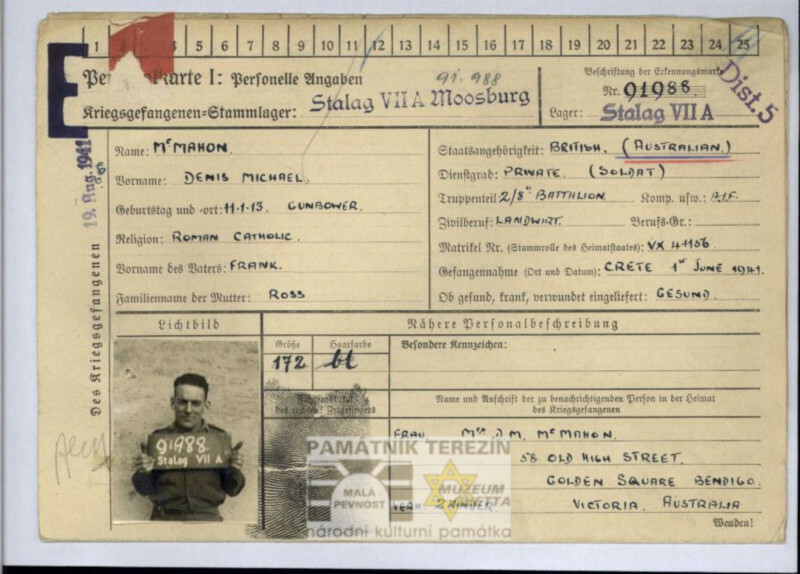 Another site on his way through occupied Europe was Stalag VIII B Lamsdorf (now in the Polish town of Lambinowice) whither he was sent on March 14, 1943. He was assigned to do forced labor in this camp as well. He gradually passed through the labor commandos E 563 and E 543, working in the local mines. In January 1945, he set out, together with his fellow prisoners from the Stalag VIII B, on an evacuation march westwards. Nothing is known about his fate during the march. But judging by the fact that he was finally imprisoned in the Police Prison in Terezín´s Small Fortress, we can justifiably claim that he had attempted to escape from the march but was unsuccessful. 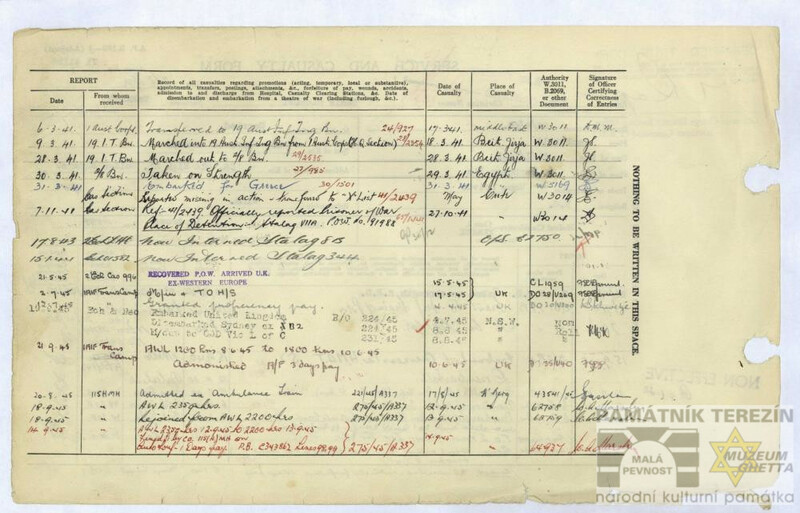 His stay in Terezín is documented by an entry on March 7, 1945 when his name appeared in the prison´s Kassabuch (i. e. Cash-book, it contains records about the movement of the prisoners´ money in the police prison in the Small Fortress, author´s remark). This was followed by an approximately one-month imprisonment in the Small Fortress and on April 4, 1945 he and other POWs left for another march heading to the Bavarian town of Weiden. McMahon survived that march as well and lived to see the end of the war. 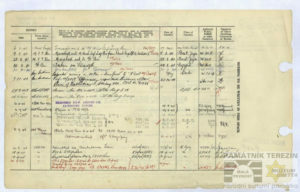 Traveling via Britain, he returned to his family in Australia on August 8, 1945. Denis McMahon died at the age of 87 years on October 6, 1999. Scant evidence has been preserved on the presence of Commonwealth soldiers in the Small Fortress in Terezín. 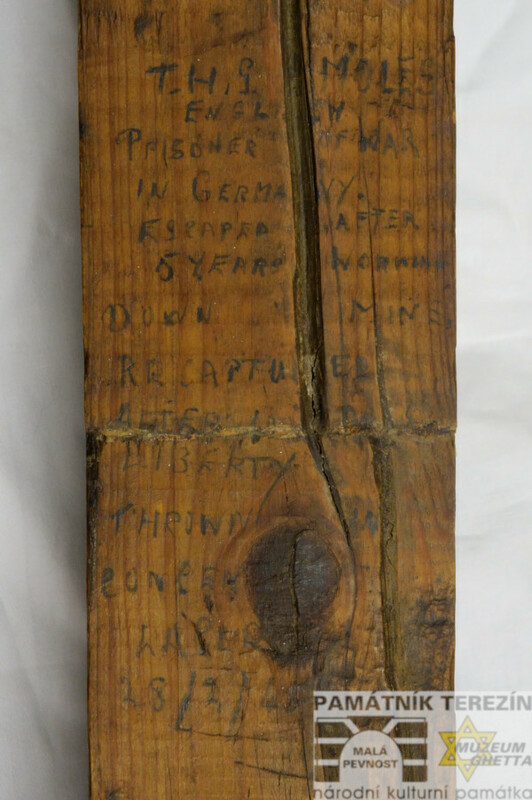 One of the most interesting items is the inscription preserved on a piece of board of a bunk bed in a cell in the Fourth Courtyard where POWs were kept. The short inscription reads as follows: ”T. 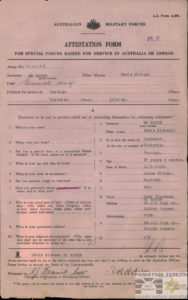 H. G. MOLES ENGLISH PRISONER OF WAR IN GERMANY. ESCAPED AFTER 5 YEARS WORKING DOWN MINE. 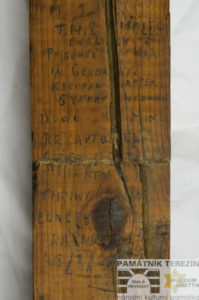 RECAPTURED AFTER 10 DAYS LIBERTY. THROWN IN CONCEN … (end of the word illegible) LAGER. 28. 2. 45.“ This inscription reveals only a few moments from Moles´s harsh wartime fate. And yet, thanks to this information, we have managed to trace down Thomas´s previous wartime history. During WWII he served in the Second Battalion of the Welsh Guard. In May 1940 his unit was speedily deployed to defend the port of Boulogne-sur-Mer in northern France where his battalion had landed on May 22. His unit immediately joined the fighting, defending the northern sector of the city. After an engagement lasting several hours there were signs that the defending units could no longer resist the onslaught of the German troops belonging to the Second Panzer Division, commanded by Lt.-General Rudolf Veiel. That was why the order was given for the evacuation of the British troops, which proceeded on May 23 and 24, 1940. But Thomas Moles was not among the evacuees, he was one of the men who took up defense positions around the pier and the railway station in the port, waiting for another ship. They managed to resist for another 36 hours. But no ammunition, coupled with the knowledge that due to the developments on the battlefield no other ship would come, made the remaining British defending troops to surrender. The captured soldiers including Moles had to set out on their reluctant journey to German captivity. He then spent most of the war in the Stalag VIII B Lamsdorf. As we know, he was assigned to work in the mines. During the winter of 1944/1945 the POWs were moved from the territory in the East, threatened by the advancing Red Army, further to the West. 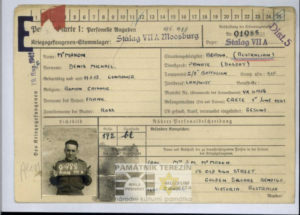 During this exhausting transfer he made his escape attempt, which turned out to be unsuccessful, and Moles was recaptured after 10 days and eventually sent to the Terezín prison. He was incarcerated there for about a month. Just like Denis McMahon, Moles and other inmates left the fortress on April 4, 1945. The two stories are just fragments of the history of the soldiers from Commonwealth countries who passed through the gates of the Police Prison in Terezín, especially in the years 1944 and 1945. However, their wartime experiences greatly differed. Some of them were taken prisoner immediately after being deployed in action, others were already seasoned combatants at the time of their capture. 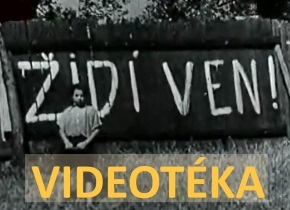 But these differences disappeared during their imprisonment; what these men experienced during their captivity in the Small Fortress probably figured among their worst memories of the Second World War.